I was in Paris over the weekend for a family celebration. While there we made a side trip to the cities primary tourist attraction, the Eiffel Tower. It was a Sunday morning and we went early to get in line to go up the tower. My 12 year old step son had never been and was quite excited, and it was fun for Caroline and I, two jaded old-timers, to be with someone getting such a kick out of it. While we waited in line a funny thing happened -- Greenpeace activists somehow unfurled a huge yellow anti-nuke banner. For a few precious moments it time, it was perfectly positioned in the middle of a ring of stars newly posted to the tower celebrating France's leadership in the EU. 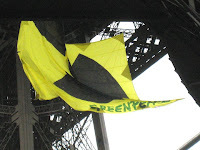 The French police shut down access to the tower, cleared the area, and removed the banner. They were playing it safe and I don't blame them, it was the prudent thing to do. However, we were sure disappointed we couldn't go up, and the sideshow was small consolation. Putting aside the inconvenience factor it had me thinking about creativity and Greenpeace. Generally speaking, I support Greenpeace. I've contributed dollars to them in the past. I won't in the future -- and not because of this protest. More because what they are doing is simply uncreative, and ineffective in terms of inspiring any innovative change. It's easy to be against something isn't it? Creativity requires that you do something positive, advocate real world solutions, not just be against things. The thinking as to the practicality and safety of nuclear power is an open debate to be sure. We've been having it for 30 years haven't we? Because of the efforts of many, nuclear power only makes a small contribution to the world's growing energy needs. I'm no longer sure this is a good thing. We're going to run out of fossil fuels someday, that's a fact. That's why it's hard to imagine a future world without nuclear power. If that's the case, what's the creative solution? Probably something along the lines of safer nuclear power, better technology for waste handling, and simply very wise usage. I believe we can solve those problems -- we really need to solve those problems. Why can't Greenpeace advocate for those things instead of wasting everyone's time with pointless and ineffective demonstrations? I say ineffective because the protest did not make television news in the UK. Not sure if it hit local news in France, it may have, but certainly this was not a Big Story, more a blip on the radar screen. In my opinion Greenpeace is lost in the fog. Lost in negativity and not contributing to solutions in the real world. I tried to post a comment on their blog (see: Culture Jamming the Eiffel Tower) and two hours after posting my comment it has still not appeared. I guess Greenpeace isn't very tolerant of any views that diverge from their own. That isn't very creative either is it? Perhaps this is another way Greenpeace does "culture jamming!" This is a great post! I love your comment "It's easy to be against something isn't it? Creativity requires that you do something positive, advocate real world solutions, not just be against things." It is really insightful! I wonder if this is why we South Africans have become "lost in the fog" of the crime, corruption and general inefficiency in our country? We invest all our energy in complaining and very little in "doing"! That's why I'm a fan of suggesting ideas to big problems. People will criticize them, no problem, at least you make them think about it. I also advocate relentless suggestions. Keep suggesting ideas even in the face of a tidal wave of criticism. What sometimes occurs is that people start listening and/or become more aware they they are Not suggesting anything. In fairness to Greenpeace, I will report here that my post to their site was approved. I was also informed that they have a blueprint for use of nuclear power that they have developed with scientists, so, they are suggesting a positive approach.